I was in New York all weekend for dance but before I left, I made a spaghetti squash casserole for dinner on Thursday night. It’s made with low-fat ingredients but you’d never know because it was so delicious. And talk about easy – your oven does most of the work! Spaghetti squash is one of my favorite foods because it doubles as a pasta swap. It’s is great for you without harming your waistline. Being so low in fat and calories also means you can add things like low-fat cheese to the squash without throwing your diet (or lack there of) completely out the window. Did I mention it’s delicious? I did… and I just did again. Preheat the oven to 400 degrees. Using a very sharp knife, carefully cut the squash in half lengthwise. Scoop out all of the seeds and stringy flesh and discard. Place squash cut side down on a baking sheet sprayed lightly with non-stick spray. Gently prick the outside of the squash halves with a fork (to allow the veggie to steam while cooking). Bake in the oven for 30 minutes or until tender and easily pierced with a sharp knife. Meanwhile, spray a frying pan generously with non-stick cooking spray. (Don’t be afraid to get it nice and slick; the spray is taking the place of olive oil.) Saute the onion, garlic and basil together over medium-high heat until soft and translucent. Add the tomatoes and continue to cook over medium heat until the mixture is dry. 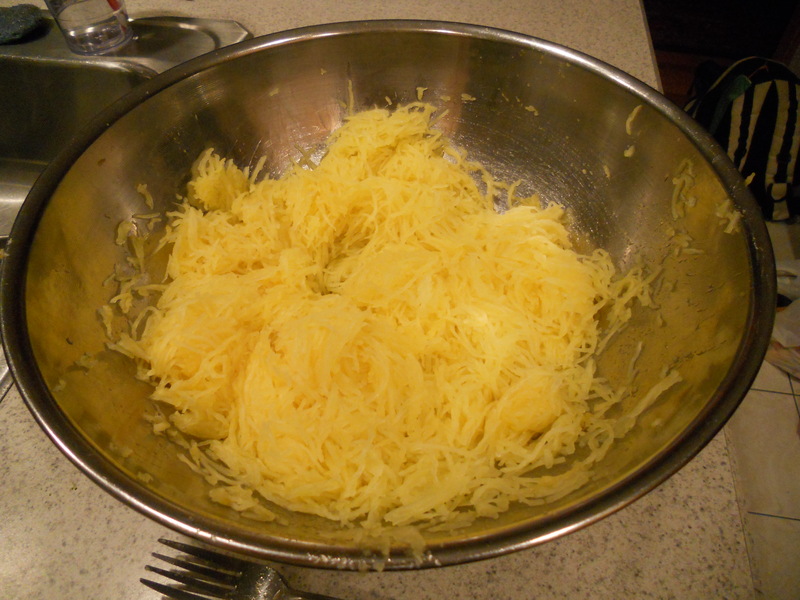 When spaghetti squash is tender, scrape out the flesh into a large bowl using a fork. It should resemble very thin spaghetti, almost angel hair. (Use a heat glove to prevent burns.) Get as much of the flesh out of the squash as possible – this could get a little messy. To the squash, add the onion mixture, mozzarella and cottage cheese. Mix gently to combine. Spread squash mixture evently into a 9×13 baking dish that has been coated lightly with nonstick spray. 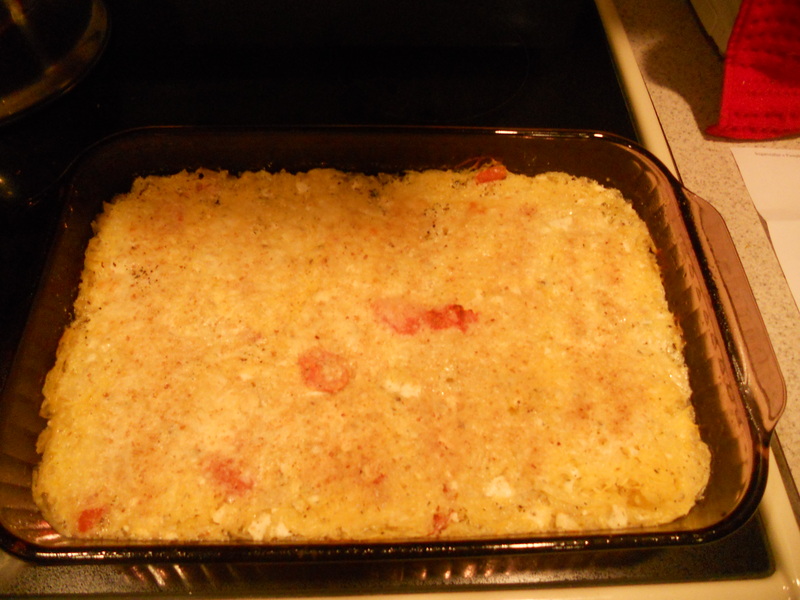 Top with the handful of parmesan and breadcrumbs. Bake in oven for 30 minutes, or until hot and bubbly around the edges. And as for my exciting news… well, I will be guest posting again for a different blog sometime within the next week or two. My good friend Christine writes a beautiful blog called Bun & Borough. She posts daily (an accomplishment in itself) and covers all topics from fashion to music, running to food. She is truly an inspiration and destined to be a famous writer, I’m convinced. I will be doing all of that cooking tonight and will let you know when it will be posted on her blog! Oh – I also start my 5K training today… 3 days a week for 9 weeks. I’ve never been a runner.. EVER. So, we’ll see how this goes. The goal is to run my first 5K sometime in mid-May before I travel to Oklahoma for dance. I hope to get through it. 30 minutes may not seem like a long time to run for some people, but for me right now, it seems like an eternity. Previous My First Guest Post!! Yummm. My mom actually used to make a ton of spaghetti squash back when she was on the South Beach Diet–we loved it! I’ll have to give this a try!